Predicting risk of recidivism: Why age, race, and gender together with 14 other variables statistically correlated with crime ought to be used at sentencing. « Hercules and the umpire. Predicting risk of recidivism: Why age, race, and gender together with 14 other variables statistically correlated with crime ought to be used at sentencing. I am pleased to tell you that my article, Federal Supervised Release and Actuarial Data (including Age, Race, and Gender): The Camel’s Nose and the Use of Actuarial Data at Sentencing, Volume 27 # 4, Federal Sentencing Reporter, at pp. 207-215 (April 2015), has now been published. * It is the lead article in that issue. The issue is entitled: The Risk Assessment Era: An Overdue Debate. 1. A meta-analysis (that is, examining individual studies for the purpose of integrating the findings of all the studies) of 131 different research papers has identified the static and dynamic variables that appear to be most predictive of reoffense. In descending order of strength of association, they are: (1) criminal companions, (2) criminogenic needs, (3) antisocial personality, (4) adult criminal history, (5) race, (6) pre-adult antisocial behavior, (7) family rearing practices, (8) social achievement, (9) interpersonal conflict, (10) current age, (11) substance abuse, (12) intellectual functioning, (13) family structure, (14) criminality, (15) gender, (16) socioeconomic status of origin, and (17) personal distress. 2. 18 U.S .C. § 3553(a)(2)(C) commands that the “court, in determining the particular sentence to be imposed, shall consider … the need for the sentence imposed … to protect the public from further crimes of the defendant. … ” An actuarial data set that includes all of the 17 variables statistically correlated with crime-including age, race, and gender-would materially assist the federal judge when selecting a sentence that protects the public against further crime. Those variables need not, and should not, drive the sentence. But they are worthy of careful and cautious consideration. In short, it is worth remembering that the blind cannot see. 4. Former Attorney General Holder’s remarks in the summer of 2014 to the defense bar about such matters was, in essence, a call for the rejection of science. As a policy matter, Holder’s arguments should not be taken seriously. *The article, the title page and the editor’s forward plus all the materials cited in the text of the article are available for free here (under “Other Items of Interest”). The articles written by others, including Professor Starr, are very much worth reading too. However, I am not permitted to reproduce them. The entire issue is available for purchase here. You can also get the Reporter at most decent law libraries. Of course, you could also subscribe by going here. **I also need to thank my long-suffering senior career law clerk Jan Rempe for her editorial assistance. (Substantively, I suspect that Jan does not entirely agree with me.) I also want to thank Scott Greenfield of Simple Justice for his critical and candid comments. I must also thank Dr James Oleson B.A., M.Phil., J.D., Ph.D. (Cantab) at the University of Auckland, NZ, for his comments and, most particularly for his stellar research. With a doctoral degree in criminology from Cambridge, a law degree from Boalt Hall, experience as a Supreme Court Fellow and as Chief Counsel to the then newly formed Criminal Law Policy Staff of the Administrative Office of the U.S. Courts, Dr. Oleson is an incredible resource. I particularly appreciated that he took the time to review an initial draft. Needless to say, Jan, Scott and Dr. Oleson are not responsible for the article and the mistakes that surely appear therein. The same is true for Supervising United States Probation Officer Doug Steensma from the District of Nebraska and his colleague Senior Probation Officer Todd Enger who, among other things, patiently taught me about the Federal PostConviction Risk Assessment (PCRA) apparatus and the Psychological Inventory of Criminal Thinking Styles (PICTS) instrument. « How do federal Circuit Judges manage their staffs? This a bit of nit, but I believe it illustrates a larger point. When you describe the outcomes for the four PCAR categories, you only use 3 or 4 numbers to describe what is surely a histogram. Instead of telling me that “7 percent of offenders have their supervision revoked, and 30 percent are re-arrested within the first 190 days from their initial assessment.” why don’t you show me the histogram? I’d like to see the histogram because seeing the distribution is always better than seeing a few, possibly cherry-picked, measures. The larger point is that this sort of misstep, combined with conversations I’ve had with lawyers (some of them prosecutors), makes me doubt the legal system’s ability to properly handle scientific or statistical data. I’ve seen no evidence that a legal education provides the proper habits of thought to understand scientific or statistical data. The basic idea, of using data for sentencing, is a good one. But I’ve got doubts about the implementation. The legal system has had, very recently, serious failures with forensic evidence — for example, the FBI and hair. If the legal system can’t get hair right, why should I believe it can get multivariate analysis right? The accusation that the former AG rejected science is beneath you. The issue of when it is morally appropriate to treat a real person as a statistical person is a moral and not a scientific issue on which there is a large literature. Particular is this true with regard to social science models where doubts about the stability of the underpinning model is appropriate. I also share the reluctance of the prior comment to turn lawyers even when judge loose on statistics. The one common characteristic of most law students is that they find arithmetic a dark science. I doubt that years of practice turn them into masters of statistics. You may be right and the former AG wrong on this issue, but having spent years of patienthood in the changing world of result based medicine and after 10 years on a teaching hospital’s IRB color me dubitante. You may remember that I stated in the article that most judges were not scientifically trained. That applies to me too. The foregoing said, several points. First, I know enough about statistics to be reasonably well informed. I had to learn this field when I was forced over a decade of time to examine and cross examine experts about mathmatical models of river flows in a regulated river with a sand bottom. Engineers and hydrologists will tell you that such rivers are really tough to model. Second, you are right, sorta, that a histogram would have been more useful. Since I did not have the raw data, and the research papers I consulted did not use a histogram, I was left to do what I did. Third, I think your view that the courts could not pull it off is, with respect, wrong. The Sentencing Commission and the staff of the Administrative Office of the United States (guys and gals like Dr. Oleson) have the capacity to do the work quite well. There are first class social scientists at both places. Indeed, I once was a member of the “Statistics Working Group” and was impressed by the people who staffed the group. Finally, I truly appreciate your taking time to read the article, and send me your comments. I have carefully read the article, and I respect your willingness to “go there.” I agree that the overarching and most (if not only) legitimate purpose of punishment is the prevention of future crime, and that the prospect of computerizing sentencing decisions using actuarial data is rightly appealing. My main criticism of the article and its conclusion is that it makes the perfect the enemy of the good. Even though, as you say, preventing future crime is indeed a compelling government interest, we cannot and do not and should not try to prevent all crime. Therefore, there is no compelling reason to incorporate race, or even any other form of “bad luck,” into the risk assessments used to make sentencing decisions, even if by not doing so we fail to prevent some crimes we could have prevented. That’s the price we pay for justice. We can’t punish people for being black or poor, particularly when a lot of the poverty we see today was and is caused by the State. Now if I could only get your thoughts on my own 1998 Wisconsin Law Review article, which likewise had to do with risk, meta-analysis, strength of association, correlation versus causation, statistical significance, etc. I have a hard time agreeing that race is solid basis to assess likelihood to reoffend. Which leads to the higher rates of recidivism for minorities. Lack of nurtured not nature drives the numbers on race, which i believe is considered by those factors outlined above. Although I’m not smart enough to figure out if those models relied upon, account for that, and my view is from more a clinical view than statistical. As for Holder, I said what I said and I meant it. As for judges and statistics, nothing in the paper suggests that the judges would need to know a damn thing about statistics to run the proposed software. As long as the underlying data was empirically validated by the Administrative Office of the U.S. Courts and the software was developed under the AO’s supervision, you need not worry about a judge not understanding a coefficient of reproductibility. Even if I am convinced that the science is good and that race is a statistically significant predictor of recidivism, I think it is a sound policy choice (and possibly a constitutional requirement) to forgo what might be the “smartest” sentencing policy in favor of a policy that does not explicitly discriminate on the basis of race. The second paragraph above, and maybe the first one, also applies to gender. I’m fine with age. Also, I predict an epic shitstorm in response to this. I hope you knew that when you decided to publish it. It’s a shame because although I think you’re deeply wrong, I feel sure your heart is in the right place. I did not doubt that you meant what you said about Holder, I doubted that the remarks came within your competence, though I suppose you have done cross exams on many philosophers of science, but I am dubious that statistical persons and judges playing with soft ware counts as science, even probalistic science. Great points John. Very persuasive. Your comment is similar to Professor Starr’s article which is extremely well done. But you are wrong on many levels. To illustrate, let me ask you a simple question: When a judge sentences a sociopath, an “immutable characteristic” in Holder’s words, should the judge ignore that information? As for your 1998 law review article, I am so damn sick and tired of my paper that I doubt you would find my thoughts helpful. That said, send me the cite and when I have time I will scan it. If something brilliant happens to pop into my feeble mind, I’ll let you know. Science has absolutely nothing to say about which of these views is better than the other. Science might tell you that race is statistically significant, but it cannot tell you that race should be considered. Only the information science brings, combined with the “oughts” you bring to the table, can tell you whether race should be considered. If Holder says that race is not a significant predictor of recidivism, and if he is wrong, then you might fairly say he is “rejecting science.” But if Holder only says we should not consider race regardless of its predictive value, then he is not rejecting science; he is only rejecting your “ought” in favor of his own. Great comment. I am not convinced, but you could throw out race and gender (although the model’s utility would be reduced) and use the other 15 variables. I don’t think that you should throw out race and gender, but that certainly would be a reasonable policy choice if only for the sake of appearances. I, too, have a hard time considering race. But like the University of Michigan Law School, sometimes race, when included with many other variables, is worth considering. Your response is perhaps even more trenchant than you suppose, because I am skeptical of the existence of free will. Thus, it seems to me it’s very likely everything we do and are is a matter of “bad luck” or “good luck.” This, of course, is debatable, as it has been debated for millennia, but it seems to me the presumption of innocence in the context of this debate argues for continuing our evolution away from retribution. But the presumption of innocence also argues, together with our lingering supposition of free will, for punishing people only for what they have actually done, in our rough and necessarily imperfect effort to prevent future crime – our “rough justice.” The sociopath has been diagnosed as such, and determined to be therefore at high risk of committing future crime, presumably based mostly on what he himself has done in the past. But when we say a black man is more likely than a white man to reoffend and sentence the former accordingly, we are basing this judgment on what other black men – not this black man – have done. Oops, forgot to add my name to the above comment. That was me again. The overriding theme of the data seems to be that being poor is the absolute best predictor of recidivism. The question is how society will address the issue. Either society can try to remove the barriers or it can just accept the barriers, give up, and sentence the poor to longer sentences than the rich. I think AG Holder is advocating the latter. I think that you are advocating the former. Next, you are probably going to ask if there are no poor houses… Quite Dickensian of you. Bah, humbug. Perhaps we could overcome this bias against the poor by saying that crimes committed by those without the barriers, i.e., the wealthy, should be punished more harshly because they have no excuse for their past behavior. So, the wealthy would be punished more because they did not take advantage of their pre-criminal activity advantages while the poor are punished more harshly because they have post-criminal disadvantages. In the end, I guess it would all wash out and everyone would be given the same sentences. IMHO, the entire study is flawed because it does not control for country of residence. That is, what is the most likely cause of recidivism in other countries? If we can find that out, perhas we can actually say what is the most likely cause of recidivism. My hypothesis would be that, worldwide, the most likely predictor of recidivism is wealth, or lack thereof. So much thinking, gnawing and gnashing! The truth is simple: those that do it, do it again. I was surprised that cognitive deficits (brain injuries, mental illness, developmental disabilities, brain damage caused by drug and alcohol addition) were not listed. I would combine gender and race and leave out ethnicity. In addition to criminal companions they should list number of enemies that want them back in prison. There are way to many variable and I think the chill factor is far more important than most of them. I an conflicted, at best, as to the suitability of factors such as race, gender, and age in advising judicial decisions: even to the extent that they are predictive and correlated with outcomes, one struggles with the necessity of culpabilty to motivate punishment. That said, I do know that all such risk models are pretty imperfect and only offer directional signals as to relative risk in populations: while models are statistically predictive for individuals, it’s not a “Minority Report” crystal ball, and should be only one factor in judicial decisionmaking. Furthermore, while race may be correlated with recidivism or other criminal justice behavior, there are many other factors which are similarly correlative, and to my belief, understanding, and experience, one can create a model without using race which is as predictive as one that contains it. Given that it’s an ethical quandary and a political third rail and of limited marginal utility, I think there’s little reason to insist on its use. Fascinating response, especially your doubt about “free will.” Perhaps “free will” is a myth, but once you go down that rabbit hole all sorts of scary things are likely to happen–and I say that being pretty much a utilitarian. As for the sociopath question I asked, I think you are playing with words. We should consider whether a defendant is sociopath because we know from other similar offenders that the sociopath before us is more likely to reoffend because we have seen what other similar sociopaths have done. Same, same with race. Thanks for engagement. All the best. In my opinion, you make the strongest argument of anyone why race should not be used. It is not worth the trouble and heartache. The difficulty, of course, is that if you drop race then you may also feel compelled to drop other predictive factors. For example, there are those who say drop criminal history because it reflects the racial or cultural bias inherent in American law enforcement. What about intellectual functioning, should we drop that too? Each time you take a bite out of the model you degrade the utility of the model. “Intellectual function” is listed as one of the 17 factors. All the best. Essentially, and your skillful rhetoric asisde, you are saying this: The criminologists who compiled and examined the data and so forth are not scientists. You are wrong, my friend. Very wrong. I do not hold that sociology is not science, I leave that argument to the natural scientists, what I do argue is that the question of when a real person should be treated as a statistical person is not a scientific question. If 8 out of 10 reoffend unless given sentence x then 2 people get the wrong sentence if you act on the statistics. To so treat people needs a justification beyond the empirical, if you want to call it that,statement about8 out of 10. Cave Kindley’s paper is on abortion, which may be another subject you have had your fill of. However an example of a moral debate about science from that subject, should the time of personhood take into account probabilities of survival to live birth.. Answer makes a huge difference in views on day after treatments, but, though I disagree with folks who say no, I would not be justified in calling them rejecters of science. And they probably did it before as well. “Cave” Kindley? Please tell me that’s an autocorrect error along with all your other typos. My paper is not about abortion. It’s about informed consent, bias, politics, and epidemiology. That’s politics. I think there’s much broader support for prediction based on past criminal history, including the crime for which sentencing is being contemplated, even if there’s a disturbing societal correlation between race and other blameless circumstances and people’s later activities and criminal record. In the end, I think there is an accessible political compromise between predictivity and palatability. Max Sand (played by Steve McQueen) is out to avenge his parents who were brutally murdered by three outlaws (played by Arthur Kennedy, Martin Landau, and Karl Malden). When all is said and done, the statistical studies are published and analyzed, it all comes down to what Jonas Cord said. That’s it. Perfectly explained in a single sentence. It should be noted that the three criminals were all Caucasian, and of various ages. We never learn their family history, but they were all sociopaths. Max kills two, and injures the third (played by Karl Malden) . There has to be some deep existential message to all this, but I doubt anyone will ever know what that is exactly. My wife is a bio-chemist, who has published in several scientific journals. She likes to criticize me for thinking about things too much, she thinks that’s a common fault among attorneys. I’ll ask her to read your article tonight. I’ll let you know what she thinks of the science. But she is an Eastern establishment liberal, so I’m giving you fair warning. P.S. Steve McQueen is my hero. But you’re right up there too! I know what the article is about but for historical reasons with regard to Judge Kopf I think the caveat is fair. As for typos, my spelling has always been atrocious , my research assistants had to be able to spell. Were I still teaching bioethics and law I would recommend the article to students though they hated statistics in informed consent problems, for example surgeons’ batting averages. I do think my Latin is right on Cave though it is 56 years since I took Latin. When I started in the criminal law theory business there was a debate H.L.A. Hart was involved with an English writer who defended indeterminent sentences as using the best available social science data by prison authorities to decide on release. A treatment model of corrections run wild. Hart argued that preventing crime justified the institution of punishment but not particular sentences. You overlook the distinction in your argument. While set the price sentencing theory has not been a great success, its failure does not justify your remedy. John with regard to typos you join a long line of SJ high school and college professors who commented on my spelling, the Sisters of Mercy in grade school were more stern.l. 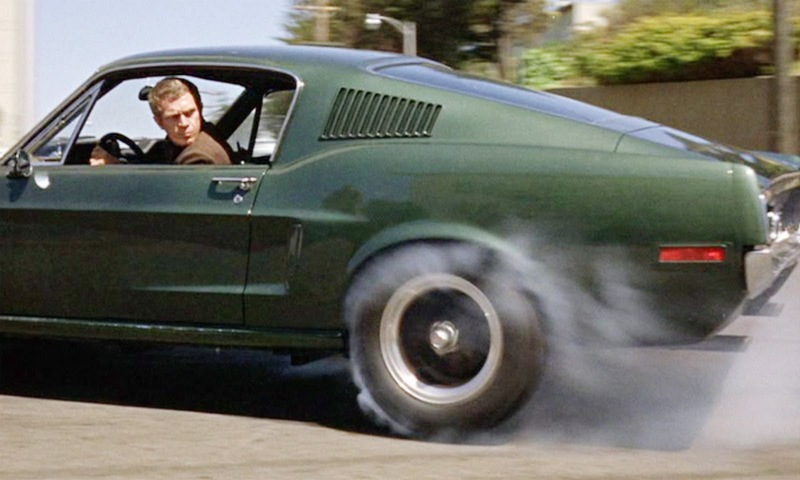 He was wonderful, but I would kill for his Ford Mustang Bullitt. You are far too reasonable. Your comment is legal realism at it’s finest. On the front of judges and lawyers who don’t know stats deciding people’s lives using a black box of software they don’t understand, count me terrified. I think this piece is apropos of the concerns I have, concerning a man nearly killed because data entry in software decided he should take 39x the normal dose of antibiotics, and nobody in the system picked up the error. And this was in a system where every human-involved step involved a medical professional who knew that the amount of medication was absurd. “Terrified?” Take a pill (or 30 pills)! I’m no expert, but if sociopathy causes recidivism, while race merely correlates with recidivism, that makes them materially quite different, no? I’ve become very suspicious of the rush to claim the “science” mantle. I probably disagree with you that any of this actuarial stuff is “science”, but maybe we can communicate on a more fundamental question: what is a real thing, and what is an abstraction? I might start and largely end with the proposition that the human being sentenced is a real thing, and the various groupings to which these scientists (and you) attach actuarial data are abstractions. Very difficult questions of metaphysics aside – and I’m sure you’d rather not go there – it’s an unarguable point. There is no such thing – real thing – as the black race, or all males aged 45. These are abstractions from real things, not things themselves. Abstractions can help us understand real things, certainly. And they can be very useful in other ways – actuarial data help insurance companies set premiums and stay solvent, for example. But the point is to understand the real things, not the abstractions. This is the fundamental error you’re making, and it’s a sort of tragic one for a judge, because the whole idea of the judge imposing sentence is that the sentence will be tailored to the individual defendant. If we’re going to decide sentences based on actuarial and statistical groupings, we don’t need judges. Some software will suffice. Let me see if I can illustrate by changing contexts. Your wife and children can be grouped on any number of actuarial/statistical this or that. Would you believe that knowledge of any of that, no matter how accurate or “predictive”, is remotely like actually knowing your wife and children, the real people? Personally, I have a hard enough time trying to know myself, let alone my wife, let alone, if I were a judge, a defendant in front of me for sentencing. This is all a reason for both lenity and mechanicalness – preferably informed by science – in sentencing. At the same time, one would think that properly educated correction officials, by their opportunity to observe the inmate over a period of time, would be in a much better position than the judge to judge the risk the inmate would present to society if released. My wife had a specific type of cancer. By looking at the statistics for the various treatment alternatives her oncologist was able to select the treatment regimen that was likely the best alternative. Now, he still examined her, and called for a variety of tests (like a biopsy of the tumor) particular to her. He altered the treatment regimen in accordance with that examination. I don’t see the use of acturial data at sentencing to be much different. Here it is. If this were baseball, you are a SABR guy. Me. I looked at them. You remain a judge. Me. I am a loser. Imagine a person with no criminal history were to have a significant amount of their life savings taken through an asset forfeiture because they were travelling with it as cash. Subsequently the person is unable to recover the cash as they are unable to convince a judge that it is unrelated to the drug trade. The person then resorts to theft and is before you to be sentenced. If the science shows asset forfeitures are a very strong indicator of further recidivism, would you feel comfortable sentencing the person to the additional time required? I would assume the government has all the information it needs to study the correlation between the asset forfeitures a person undergoes as well as any prior or subsequent criminal convictions. If the study is never pursued, would you trust the scientists? Are the actuarial data sets publicly available? I’m curious as to how removing categories reduces the model’s utility, and I’m wondering how much variability there is for individuals who fit into the same “bucket”. I do not have access to the raw data. Sorry. Maybe, but probably not. That is, there are definite traps in attempting to utilize all those variables. First, the world is full of spurious correlations, even some that are plausible. We are entering an age of Big Data, where data driven algorithms make decisions that are intended to make money. That may or may no be profitable, but it is not science. Science requires theory. As we all know, correlation is not causation. Does anybody have a causal theory relating race to criminality or recidivism? Simply relying upon correlation may be good enough when it is a question of which advertisements to show a visitor to a web site, but it is not good enough, I submit, for the application of justice. We used to have charts of recommended weights for males and females. Gender was considered a relevant variable, probably because it usually is, in medical matters. We no longer use such charts because it turns out that gender is not relevant, height is. Gender seemed to be relevant because women are on average shorter than men. One problem, both in statistics and in reasoning, is the use of the same evidence twice. Often this happens because the source of the evidence is unclear, and so we are unaware of using the same evidence more than once. It can also happen with correlated variables. For instance, suppose that one study finds that a relevant variable is height. Suppose that another study finds that a relevant variable is the height of a parent. Not only are the two variable correlated, the height of the parent is very likely to be irrelevant, once we know the height of the person. In that case, if we try to take both variables into account, we will make erroneous conclusions, because we will be, in effect, counting the height of the parent twice. The 17 variables contains several that are obviously correlated. E. g., (1) criminal companions, (2) criminogenic needs, (3) antisocial personality, (4) adult criminal history, (6) pre-adult antisocial behavior, (9) interpersonal conflict, and (14) criminality. If the judge assesses each of these variable **as though they were independent** the use of these variables is likely to be a hindrance, rather than a help. There is also the problem of overfitting the data. There is a good chance that 17 variables are too many to make a robust predictive model, given the data available. IIUC, the PCRA uses five variables. That’s more like it. Identifying the 17 variables is a first step to coming up with a useful model, but it is not a model, and an actuarial data set with those variables is unlikely to be a useful tool. Great points. And thanks for the link. I kinda like statistics but really like babes.